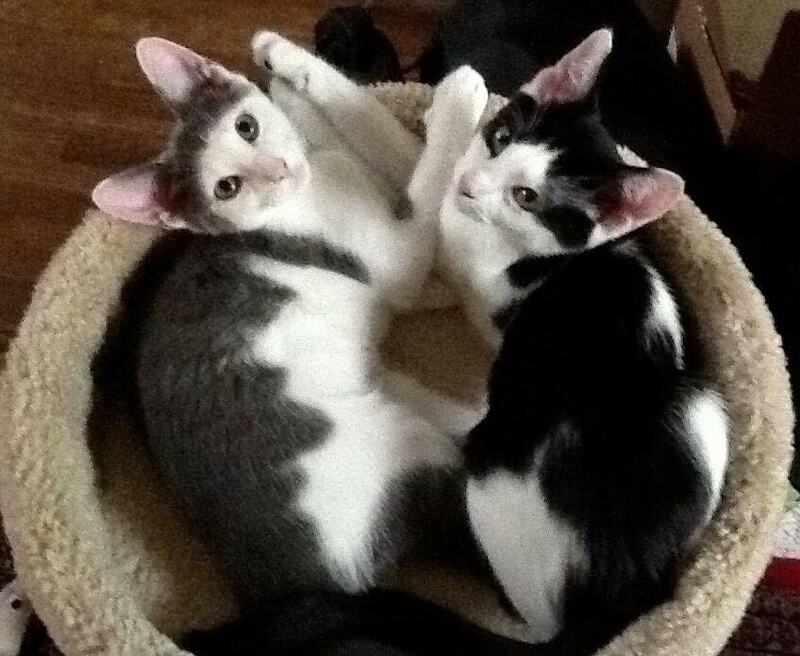 We got Maggie Moo and Cassie at 3 months old at the Forgotten Cats organization. 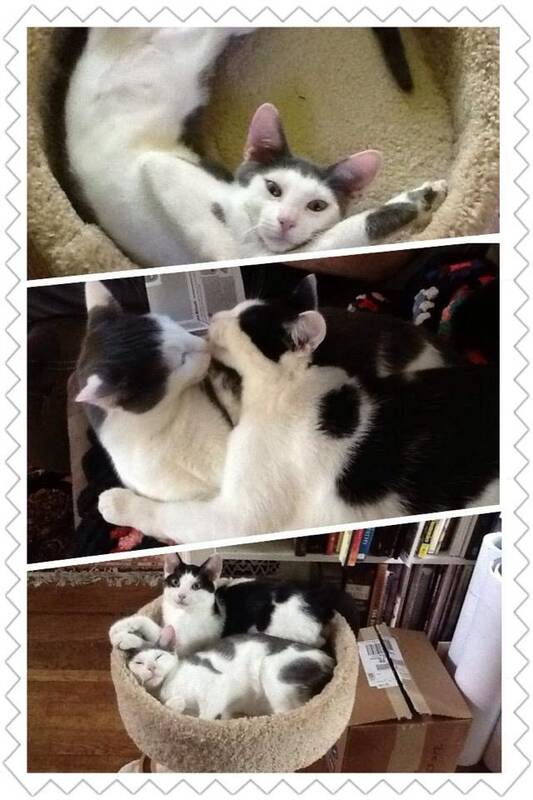 Their mother was feral and they were born in a vet hospitalðŸ˜¸ðŸ˜¸ omgâ€¦..itâ€™s unbelievable how big they got !! Now they are 5 years old. When younger both could fit into that cat seat but NO WAY nowâ€¦â€¦only one big girl fits in it at a time. Are these the CUTEST Kitty pics or what ??? AND YES THEY KISS !! Itâ€™s hilarious all the crazy antics theyâ€™ve done and mischief theyâ€™ve gotten into. I have endless stories ! So Iâ€™ll just give the highlights. Well they are from the same litter so they are twin girls . But did you knowâ€¦â€¦â€¦cats can get pregnant by different male cats at same time so in one litter there could be different fathers! Yesâ€¦â€¦our vet tech told us that. I think my 2 girls might have different fathers indeed. ï�¶ They used to grab bananas off the counter and hide them under the couchâ€¦â€¦.lmao. I think because the texture reminded them of mice bodiesâ€¦â€¦.ha! 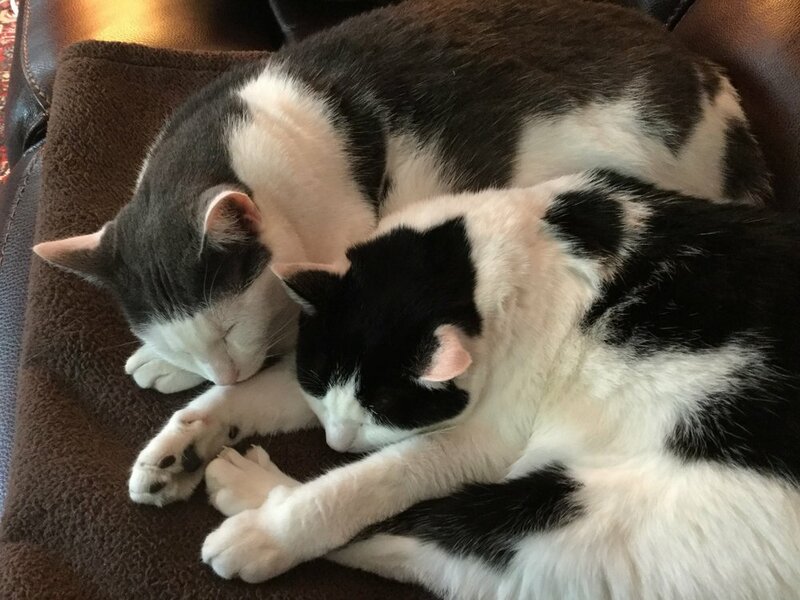 ï�¶ They will fight like cats and dogs â€¦â€¦but never draw bloodâ€¦.and then later snuggle together ðŸ˜»ðŸ˜» like 2 peas in a pod. They are 5 years old TODAY !! ï�¶ Cassie is so laid back and not mischievous at all and yet out of the blue while petting her sometimes sheâ€™ll bite you chomping hard ! Whereas Maggie Moo who is so sneaky never bites anyoneâ€¦â€¦..ha! Cassie will lay like this for as long as a half hour.......ha! ï�¶ They must stay in their cat room during work days and at night and in the morning they start throwing themselves against the door while meowing super loudâ€¦â€¦at least it sounds like thatâ€¦.not totally sureâ€¦..but we had to put a lock on door because they rattle the door knob tooâ€¦â€¦.and I was pretty sure theyâ€™d open it one dayâ€¦â€¦..ha! Same box......BUT Cassie cannot fit in it all the way.....but there's no stopping her trying to anyway.......if her sister did it....so will she !! Â©Diana Riukas. 2018- All images and content are the property of Diana Riukas and cannot be used without prior written consent. Thank you.